Arn Chorn Pond is another Cambodian treasure who have done so much for the country. We go way back to 1995 when our paths first crossed in Boston, MA, and since then, I’ve had the honor to call him a good friend, a brother, and a mentor. If you know want to know who the heroes are in Cambodia, read this article about Arn. Girl Rising Now Streaming on Netflix! 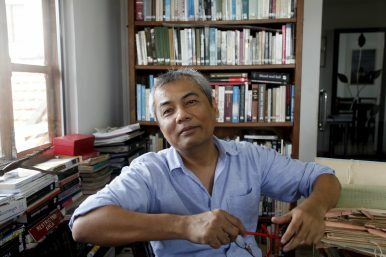 Author Seng Ty experienced firsthand the terrors of the Khmer Rouge genocides — horrendous events that left Cambodia ravaged in the 1970s. Within weeks, he and his family went from living a peaceful life in the Cambodian countryside to surviving in conditions comparable to those of a concentration camp. Find this Book! An explosive report in Newsweek last spring raised questions regarding the legitimacy of Cambodian anti-trafficking activist Somaly Mam, tainting the nearly two-decades-long work on behalf of victims that catapulted her into the global spotlight. But how do the allegations hold up? In her first interview since the scandal dominated headlines—and left her career and reputation in shambles—Mam tells her side of things. Watch this 3 min video and be inspired! For Linda football was her only chance to avoid an early marriage with a much older man. Succeeding in a football competition was the critical point in her life that allowed her to have a future very different from the one most girls in her community do. CLEVELAND – Dan Austin, the man Outside Magazine named as one of “Ten Icons Changing the World,” is coming to Cleveland April 11-14. Austin is the co-founder of the 88bikes Foundation which donates bicycles to needy children all over the world. He’ll be speaking at Market Garden Brewery, 1947 W. 25th St., Cleveland, 6 p.m.